The Fishers waterfront homes on Geist Reservoir are known for their breathtaking setting as well as their convenient proximity to the cities of both Fishers and Indianapolis. Geist Reservoir was constructed in 1943 as a vacation destination for Indianapolis residents. Today, Geist real estate tends to be permanent homes for many commuters who work in Indianapolis and Hamilton County. Geist homes can be found in Fishers, McCordsville, and Indianapolis. Homes and neighborhoods on the Fishers side of Geist are connected by a pedestrian path that runs several miles along the banks of the reservoir - a huge attraction for area runners and walkers. Geist Reservoir real estate ranges from modestly priced fixer uppers to stunning waterfront estates with multiple boat docks. 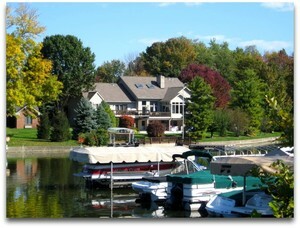 Many of the neighborhoods on Geist Reservoir are exclusive, gated communities. Homes in the Geist area range from the $200,000s to more than $2 million. The Geist area includes several excellent restaurants. Scotty's Lakehouse is a great place to grab a gourmet burger and watch your favorite game. Mama Bears serves coffee drinks and breakfast fare, and Bella Vita on the Marina offers elegant dining and dockside service. Below you'll find the latest Fishers waterfront homes for sale on Geist Reservoir. To see more homes on Geist Reservoir, or any other real estate for sale in Fishers and the surrounding areas, just fill out the property search form above. When you sign up for this free information, you'll begin receiving e-mail alerts as soon as new homes that meet your criteria come on the market. You'll also be alerted to price changes for any homes you've already seen.